Marina Bistrin is an avid gardener. 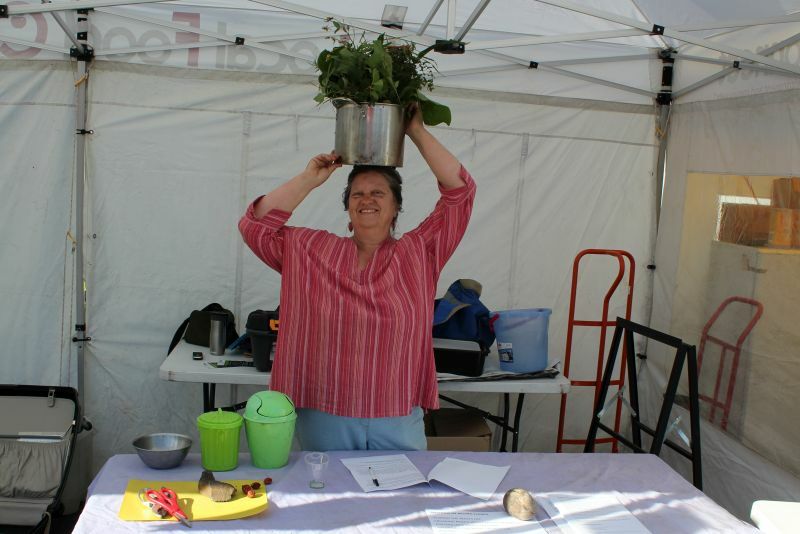 In February 2017, she gave a presentation on ‘extreme composting’ at Eltham Farmers’ Market. Here are her notes. If you have the time and space at your place to compost the contents of your green bin, it’s a great thing to do. You can compost everything, from the easiest to the most difficult weeds, logs etc. It makes fertile, nutrient-dense compost, especially if you include the weeds. It lessens the work that your Council has to do with picking up green waste and transporting it to sites in the countryside that will do the composting (also, the compost that you buy back from Council often includes woody waste in the mix which results in a less nutritious compost). 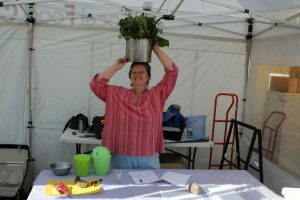 Finally, dealing with your weeds can be fun and a great children’s activity (I think squashing with rocks is especially enjoyable!). Why are weeds good for your compost? Weeds have a lot of leafy matter full of minerals and many deep-rooted weeds mine minerals from deep in the soil that your veggie plant roots can’t reach and that have been washed down out of the top layer. The weeds bring these nutrients up to the surface in their leaves, which you can then compost. Many weeds are also part of herbal medicine, and some are classed as tonics because they have so much nutrition in them. The difficulty with weeds and prunings is that some can re-grow in your compost and therefore need to be treated differently. That’s why I invite you to sort your common weeds into your best (easy to compost) and worst (difficult to compost) weeds and decide which you can hold onto for your compost. If you have the time and energy, plus the space on your land, you may want to compost absolutely everything, or at least try it once as an experiment. The easy to compost weeds can often just be dropped onto your garden and left there to break down, without risk of re-growing. It looks a bit messy, but that’s your choice to make. I have been composting mostly in plastic cylindrical compost bins with lids, which keep the moisture and heat in, and also composting on paths with prunings and grass clippings, wood chips etc. I have also made compost on concrete paths next to the house to cool the house too. These are the methods I have used to deal with weeds before composting. You may want to use a combination of methods for different parts of the plants e.g. treating leaves and roots separately. Crushing roots with fingers or a rock. Drowning for weeks or months. Steaming (solarising) by leaving in a plastic bag on hot footpath for days or weeks. It’s useful to think of the plant according to its different parts as some are much easier to compost than others. Runner roots: a few of my worst weeds are the invasive grasses with runners such as kikuyu and couch. These thick runner stems or roots grow underground, and have a store of starch or energy – with growth (new leaf), they tend to grow in sections, with at each end of the section. Tradescantia will grow from small sections of stem too, but has soft tissues which you can crush these easily. Another plant I have difficulty with is ivy – they have strong stems and roots, and will regrow from small sections too. Creepers such as honeysuckle are almost as difficult to deal with as they spread by layering – stems that touch the ground can send down roots. Bulbs/corms – oxalis, agapanthus, watsonia, onion weed. These can all be crushed with a rock or drowned, steamed. Deep taproots – dock, comfrey, dandelion. These tend to send up leaves again and again from any roots sections left in the ground. They bring lots of minerals up the surface via their leaves, which can be a good thing. Fibrous, tough roots – ivy roots, honeysuckle, shrub roots. Can be cut into small sections – solarising or drowning. Seeds – grasses (ripe seedheads), other seedheads and fruit. Heating is most effective. Best to weed before seed set takes place. Cuttings/prunings – shrub prunings. such as hydrangea, mirror plant, camellia, privet and roses, may grow from cuttings. Other plants that grow from cuttings include ivy, succulents, geraniums, purslane. Insect damage or disease – citrus gall wasp in prunings. I suggest boiling citrus gall wasp – it kills the larvae quickly..
Soft bodied and rooted plants -cleavers, chickweed, petty spurge, grasses without runners. Often ripping the roots off is enough. Thorns – thorny prunings; roses and bougainvillea. They are dangerous as the thorns last a long time in compost and may give you a nasty infection if they haven’t decomposed and you may need a tetanus shot. You can chop the tips off the thorns. Seeds such as peaches and nectarines also have pointy ends – you can rub the ends of them onto concrete paths or crush the ends bit. Logs and branches. Usually branches don’t re-grow and can be used for composting either in or on the ground (Hugel mounds) or for edging. Hugel mounds absorb and hold a lot of moisture for years, and they encourage fungal growth which helps other plants. They can also help to create moist microclimates or havens which protect your plants from wind and drying out and add interest to the landscape. They also can be piled up and planted over, so that you get more surface area to grow on. Even dry branches are useful as windbreaks and shade and cool the soil in the summer heat, and you can grow crops up them such as beans. They can also shelter lizards and other creatures in your little ecosystem. If you have a blue-tongued lizard, they like to eat snails and slugs. Removing couch by carefully digging it all out, or smothering as in a no dig garden. A trailer for Farming With Nature: permaculture, including Hugelkultur, on a mountainside in Austria with Sepp Holzer – an interesting synopsis of his methods with beautiful visuals of his farm. Nillumbik Council allow food and meat scraps in their bins, wrapped in newspaper – they go to the Veolia facility.